rec. Glenn Gould Studio, CBC, Toronto, 10-14 November 2010.
rec. Dynamic's Studio, Genova, Italy, 25-26 January 1996.
rec. Genova, Italy, May 2009. It is probably fair to say that Nino Rota's 'serious' music has been so widely recorded thanks to the success of many of the 150-odd film scores he wrote for cult directors like Fellini, Visconti and Coppola. His chamber music is especially well covered: the three CDs under review here, for example, were all released between 2011 and 2013. Little effort is required to find many more recordings, such as the Albatros Ensemble's mixed-programme released by Stradivarius in 2008, featuring several flute-based chamber works plus two for violin and piano, including Rota's only sonata (STR33790). A few years previously the aptly named Ensemble Nino Rota had recorded a similar programme for Chandos, albeit concentrating on longer works, again including the violin sonata (CHAN 9832). Dynamic dipped a second early toe into these waters around the same time, the Solisti Dauni's recording of Rota's Nonet being the big draw there (CDS288). BIS had got there first, however, Kremerata Musica and the Hagen Quartet combining for a programme that included not only the Nonet, but a bit of everything else from Rota's chamber stock too (CD-870). This review covers four further CDs, all again on different labels and including two recent releases, that offered, for the music lover's delight, interpretations of the composer's complete works for viola/violin and piano. Yet it must be said that Rota's significant body of non-film music stands up to scrutiny very well on its own. Orthodox it may be, but it is also sophisticated, inventive and not infrequently profound. There may be little sense of stylistic 'progression' down the years, but Rota more than compensates with a lyrical fertility that few of his contemporaries could match. 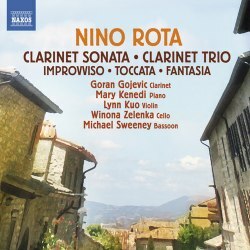 The Naxos disc, for example, is glorious: Rota at his breezily nostalgic best, with some ravishing cantilenas - the slow movement of the Clarinet Trio, for example. Sound is first-rate too and the musicians give terrifically poised performances, especially clarinettist Goran Gojevic and pianist Mary Kenedi. The Fantasia for solo piano, insofar as it is not a chamber work, makes for a rather rummy conclusion to the programme, but at least it illustrates well the breadth of Rota's capabilities, and has a nice valedictory feel to it. 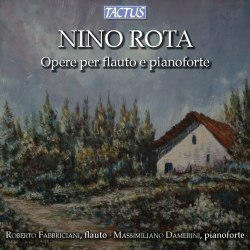 Roberto Fabbriciani's programme of flute works for Tactus offers chiefly miniatures and transcriptions, but is no less interesting or entertaining - Rota's writing is uniformly high-quality. Fabbriciani was the original dedicatee of some of these works, most significantly the 'Flute' Sonata, and this recording thus combines his experience and expressiveness with an aspect of authenticity. The composer-authorised arrangement for flute of the Violin Sonata is highly idiomatic and rather beautiful, oozing romance and nostalgia. It can only be hoped that flautists everywhere hear this version and add this work to their own repertory. Though obviously less profound, the Fantasia on Film Themes is another noteworthy piece, taking some of the most memorable tunes from Rota's own scores for Fellini, beginning with the haunting 'Godfather' love theme and ending six films later with the suitably cheeky 'The Clowns', which is - for better or for worse - faded out, with added echo to boot. The recording is close enough for Fabbriciani's every breath to be audible, but in other regards is good. The Italian-English booklet notes by Cesare Valentini show a true understanding of the layered nature of Rota the composer. This is arguably one of Tactus's finest CDs. The Dynamic disc, volume 33 in their motley 'Delizie Musicali' series', is actually a reissue of CDS172, which originally appeared a decade or more ago. The slightly uneven audio quality is self-evidently down a notch on the Naxos and Tactus recordings, but still quite reasonable. For their reissue Dynamic have dropped the 'Easy' from the title of Rota's Five Easy Pieces. Perhaps their thinking was that they are not all that easy after all - flautists like Mario Carbotta merely make them seem so. 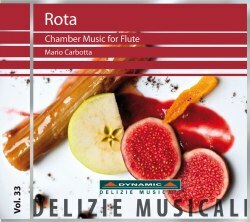 The booklet claims Carbotta's programme constitutes Rota's "complete chamber works with flute", although a glance at the Tactus contents reveals the absence of the fleet(ing) Allegro Veloce for flute and piano and the Tre Pezzi for two flutes. Nevertheless, it too has much going for it, including some of Rota's most imaginative works - the Quintet, the Sonata for flute and harp and, in particular, the passionate Trio. Carbotta is in fine form as usual, but he is well supported by a sterling group of soloists.